whoa, there really are a lot of pics of Gerard Butler in his Spartan togs out on the web. [sfx:crickets] What? You try googling images for “alien butler” and see if you can avoid pics of men in leather speedos. Oh all right. 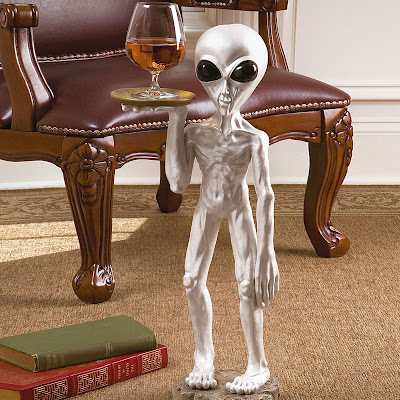 I just have nothing much to post about, as I’m busy consolidating my main websites into a more coherent web presence, and I want to play with an alien butler graphic as part of the landing page theme (because they are cool examples of woo-kitsch that you have to love). I’ve found that having too many separate pies online is too fragmentary, so I want one page where people can go and decide whether they want Viv the webwrangler, Viv the comedy tragic, or tigtog the scary progblogger – still three separate spheres, but a little more obviously still all me, and I can just link to one site instead of having to pick which one I should link to all the time. I’ve also created a second twitter account (@vivsmythe) that’s intended for tweeting webstuff & comedy more than politics updates, separate from my current updates-protected one where I’ve just been getting the hang of the thing (and is anyone else getting lots of follow requests from update-protected sites with scantily clad ladies as the logo? Or is some idiot spamming me?). Has anyone else spring-cleaned their web-stuff lately? Nope! I’m a complete mess, and likely to stay that way for the foreseeable future, given that I can’t afford what it would cost to get someone else to sort it out (and by the time I’d explained, I could probably have made a decent start on it myself). Priority one today is to open my mail, and pay my bills. If I get that done, it’ll be a good day. I think lifestreaming is becoming the way to go for those of us with multiple forums. I didn’t see the appeal initially, but I’m coming around to thinking that it has its uses. My web stuff needs some serious spring cleaning, and winter summer and autumn cleaning too. But where to start. Not sure what tips me off, but I reckon that alien cactus is a scam. Yep…I got my first twitter-spam follow request within a few hours of setting up my twitter account. tigtog: I haven’t yet figured out what lifestreaming is. It’s a cyber-aggregator of your own online spaces – you set up a lifestream page that aggregates feeds from Flickr, Facebook, Twitter, your blogs, your Diggs and Stumbles – anything you want to add. That sits on its own page that you can set to be a homepage or a link from your homepage. So it’s a snapshot of all your different areas of interest on the web. Aha! See, because I do everything on the one computer, I’m a big fan of local aggregation of such things. So Seesmic Desktop (at the moment) for two twitter accounts and facebook, and my RSS reader (NetNewsWire, do NOT install the latest beta) for flickr/blogs/livejournal/dreamwidth/page2rss subs/etc etc. Mail.app for regular email, and good old MacSOUP for most mailing list email and Usenet. I’m more a fan of the specialised tool than the inferior-for-everything Swiss Army Knife, and I can prioritise things very finely this way. Yes, Lifestreaming is for other people to look at what you’re doing, not for you to use to manage your own cyberplaygrounds. So it’s very much not for everybody and people should choose carefully which of their cyberplaces they want to include on it. But for someone who’s actually marketing online services or perhaps a performer profile on the web, lifestreams are a great idea.